Memory Lane Antiques on Hyde Park will always be a special place to me because it was my first. 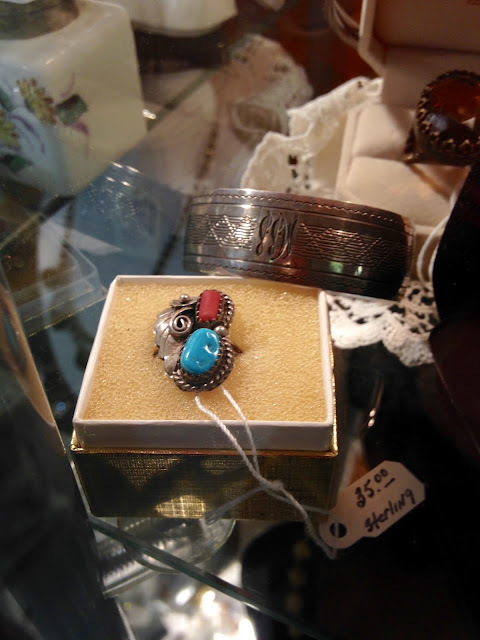 A friend of mine in high school knew I had a penchant for costume jewelry, and at the time, she was the only one of us who had free reign of her parents' car (an 80s Oldsmobile station wagon with wood panelling, no less). She was always thrifting, always exploring, always showing up with jewelry and clothes that were better than ours. Shortly before prom, she decided to share her secret with me, so she took me to a nondescript flat boxy white building that was unbeknownst to me, right around the corner from the house we had just moved into two months prior. The area was still in the nascent stages of development so the place stood out. 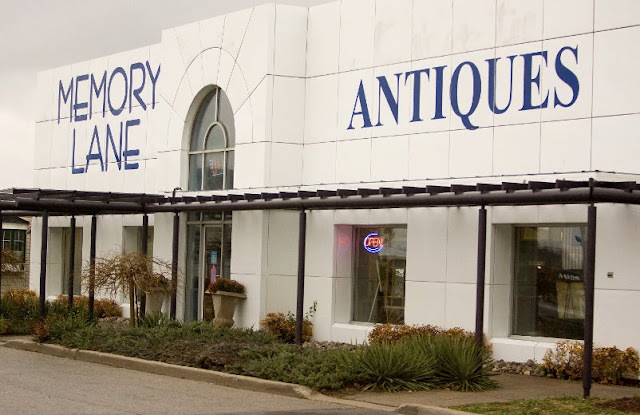 The building was snow white and tiled like an igloo and it shared real estate with a patio furniture store and a fitness center; on the other side of the fence was a ramshackle Thrifty car rental/used car dealership; and it's parking lot was potholed and mostly gravel. 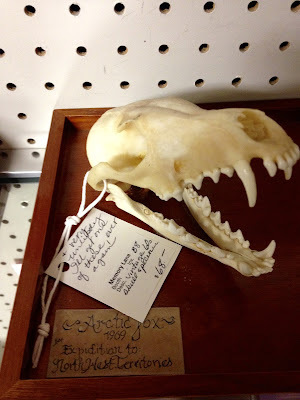 We sauntered in and proceeded to fog up glass display cases and fumble with old necklace stands. She walked away with a cherry red 3-strand tiered necklace and I with a new obsession. To celebrate my new business dealings with them, I'll post the things I coveted and bought (both for me and for my booth) when I was there this past Saturday. 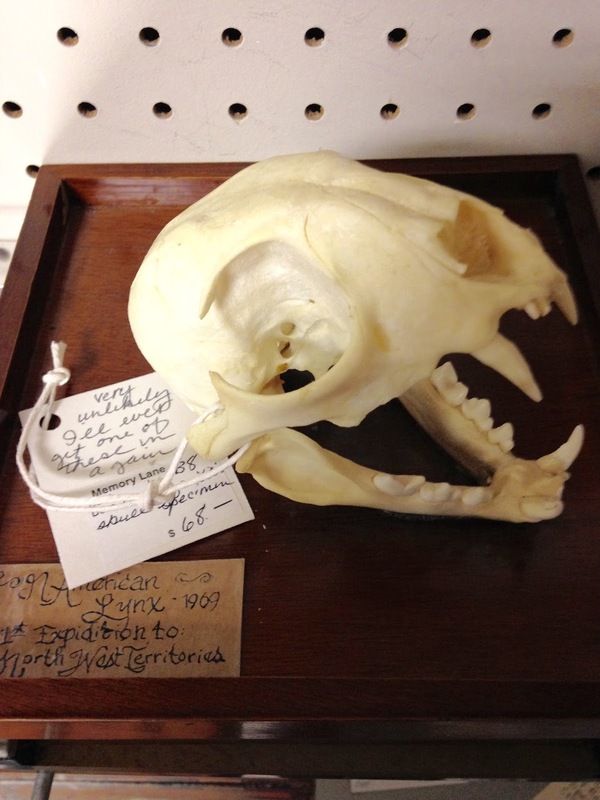 Loved these lynx and arctic fox skulls $68/head. A counterfeit Balenciaga City bag in seafoam green for $89. Such a big disappointment. 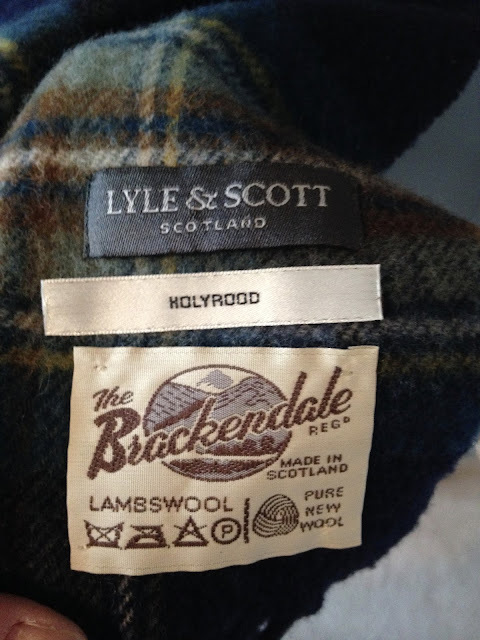 One quick Google search and all the indicators of a fake bag unveiled themselves to me. 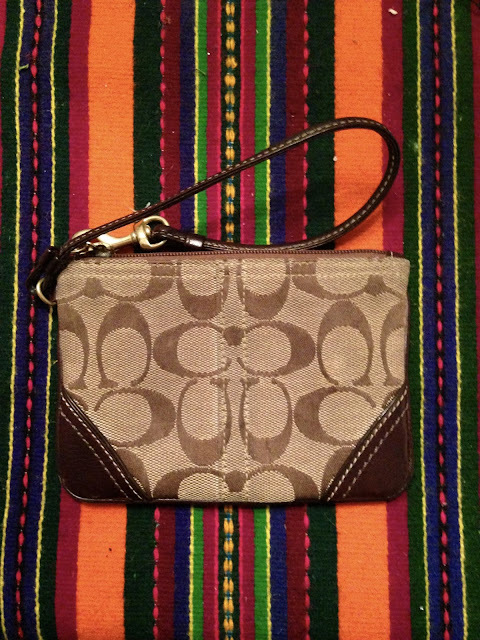 There are so many of these on Ebay too, caveat emptor! 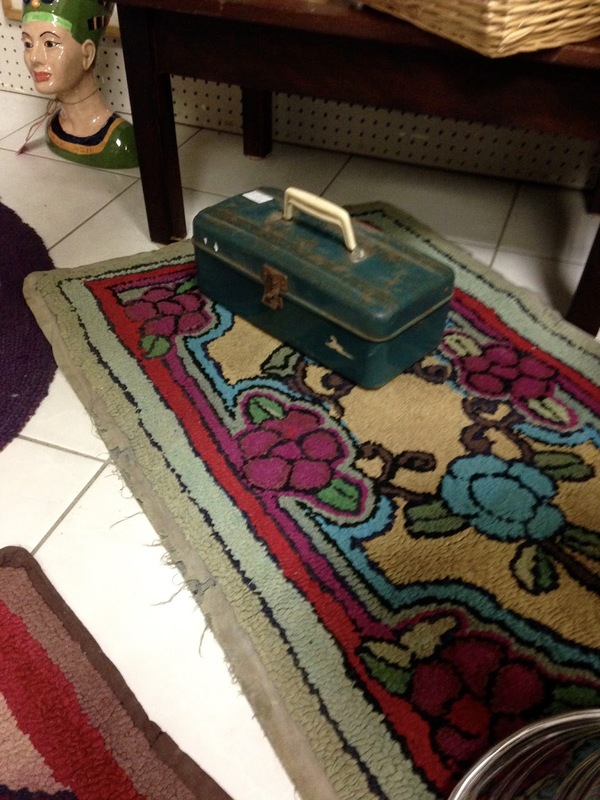 Old toolbox for $8 and one of the rugs for $18. It was half the price of the other one because the edges were frayed. I went with this turquoise and sterling ring for $40. 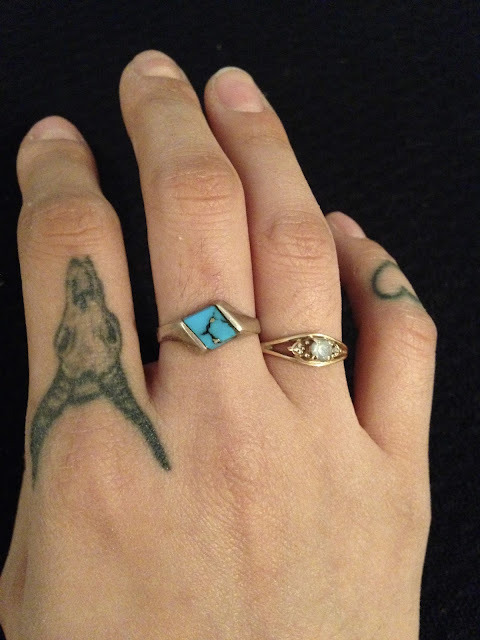 The woman at the store thought it was overpriced for the size (and she gave me a store discount because she felt bad for me) but the geometric style is more me and it's very rare finding rings that fit my (hairy) baby fingers. My middle finger is a 5 1/4 and I'd have to guess this ring is a 5 1/2 because once I got home and I wasn't all hot and sweaty from walking around, it no longer fit. I'll have to get it resized. 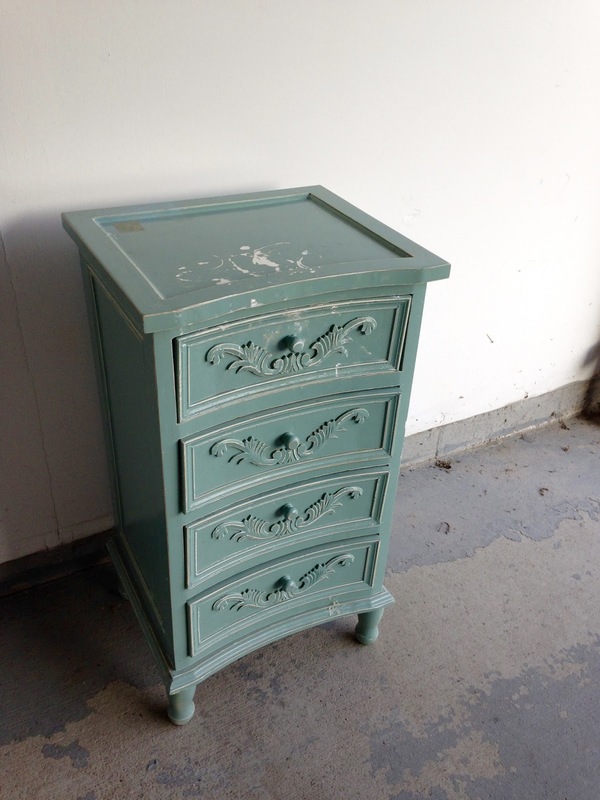 Today I also picked up this cute little turquoise dresser off Kijiji that I'll be putting up in my booth (#B12! May 1!) sometime soon. It needs a bit of love but I think it'll look great after I clean it up a bit. Today was chaos wrapped in a bow. I had too much caffeine the night before and was up until 7am, rolling around in bed, watching the darkness slowly dissipate. I finally fell asleep and was woken up by Blixa at 8:10. 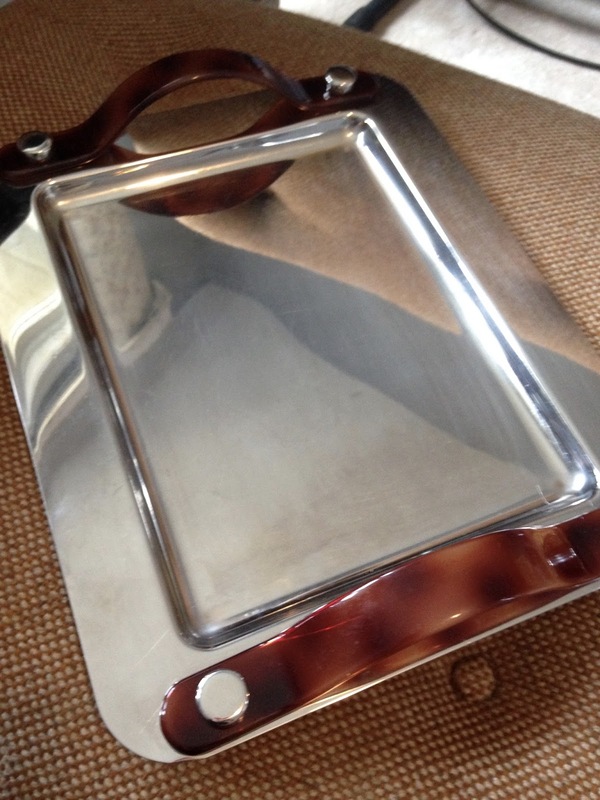 Oscar de la Renta stainless steel jewelry tray with Lucite tortoiseshell handles and chromed caps. This will be going in the booth. It's listed on Ebay here and here, for US$69.99 and US$128, respectively. The tray has "Intrusion" stamped on the bottom so it must've been used as a perfume tray, especially since the bottle also has tortoiseshell on it. 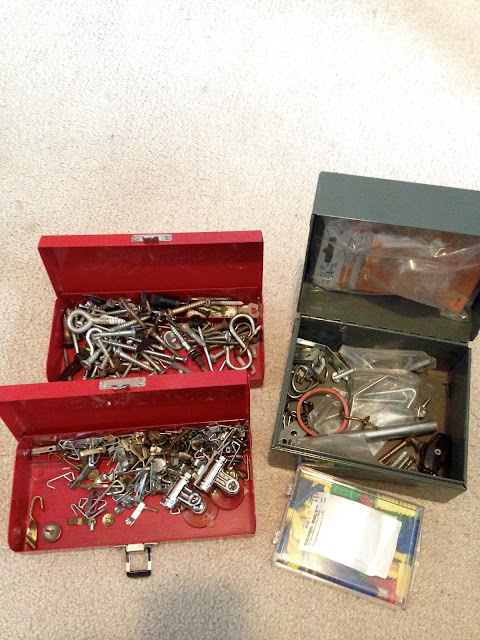 Three small industrial metal boxes for $10 were brimming with nails, hooks, screws, and metal bits and bobs. 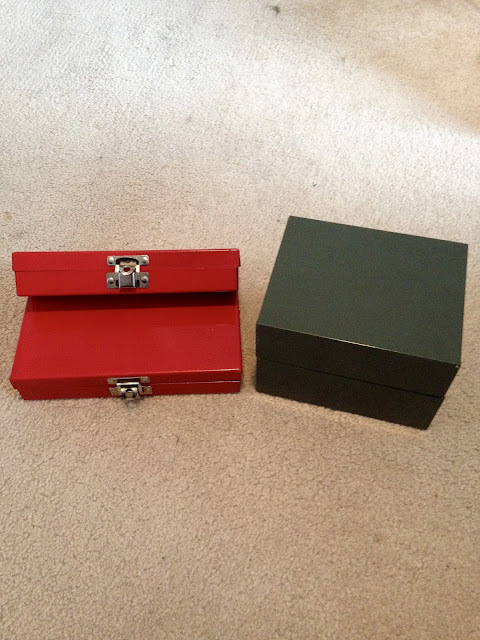 I might keep the boxes, I might sell them. Either way, I needed hangers and S-hooks. Talize had a storewide 50% sale today and it was hectic. I didn't stay long, there were way too many people. 6 copper and brass teacups. No saucers, unfortunately. Value was probably my biggest success because not only did I have a 30% off coupon, but the cashier didn't ring in two of my items. Major score. 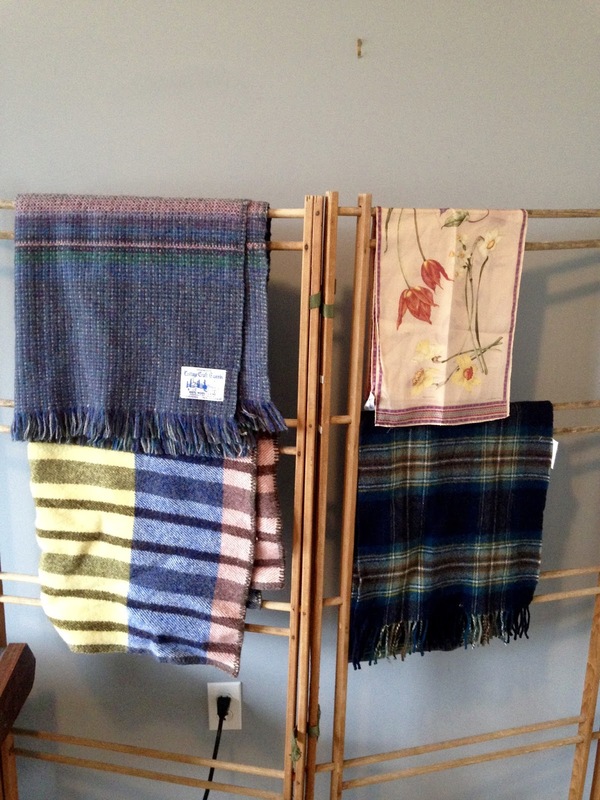 2 wool throw blankets on the left, one untagged, one tagged "Handwoven Cottage Craft Tweeds: Made in Canada New Brunswick." 2 scarves on the right; the top on a silk floral Liz Claiborne and the one on the bottom, a Lyle & Scott lambswool. This is the one she forgot to ring in, probably because I had so much wool. 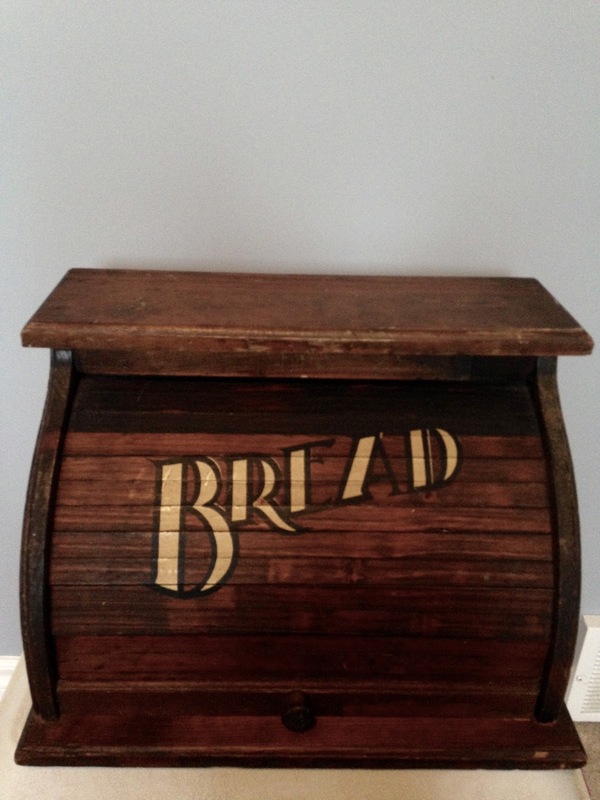 A vintage roll top bread box that is still in really good condition. 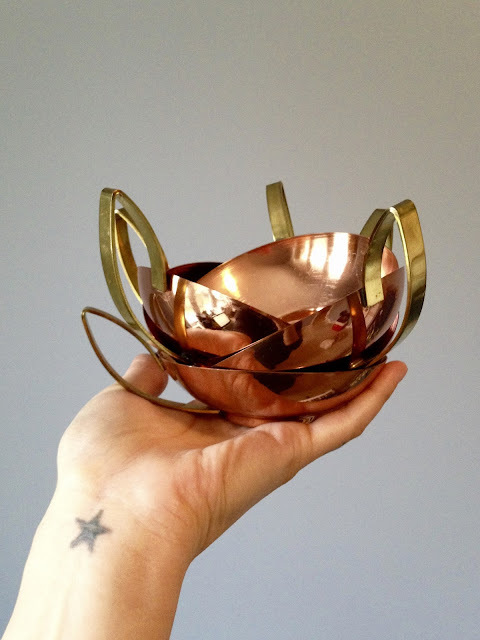 These sell incredibly well on Etsy and it's currently listed on Ebay here and here, for US$55 and US$79, respectively. And the last thing she forgot to ring in, a classic Coach wristlet. 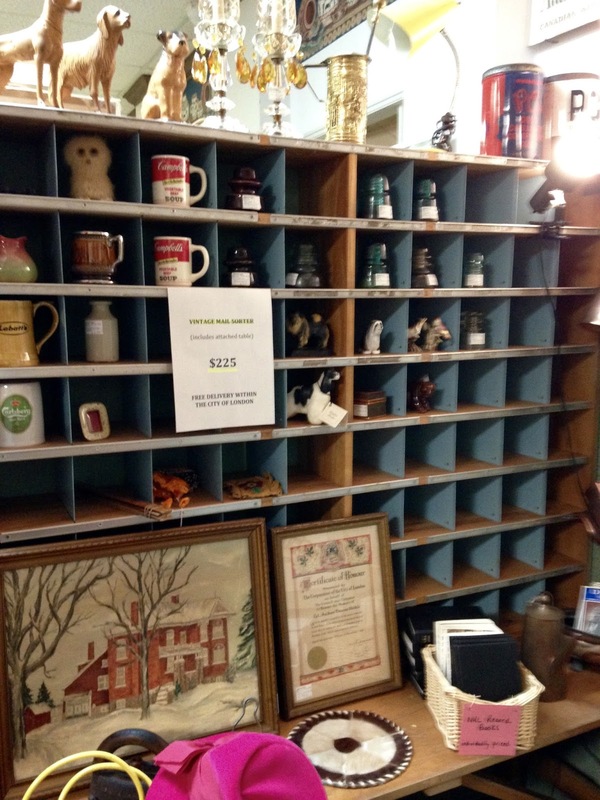 I'll be listing this on Ebay in the beginning of April. And that, my friends, is the end of a Christian holiday I do not celebrate. But, I do love the tasty chocolates it inspired, so I hope everyone had a Happy Mini Egg weekend!